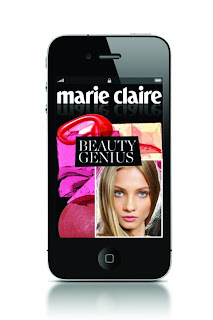 Marie Claire recently announced the launch of its first iPhone app - Beauty Genuis and it has done so well it made Apple's App of the Week in its 1st Week! This App has 34 amazing how-to beauty videos and 45 minutes of expert hair and beauty master classes. Taking the hottest, latest looks from the catwalk and showing you easy ways to recreate them at home and including recommendations on products to achieve this. Stumped over a smoky eye or baffled as to how to achieve the perfect pout ? Top make-up artists and stylists , including top celebrity make-up artist Jackie Tyson (she has worked with Sienna Miller, Lily Allen, Katy Perry and many more) will show you how in step by step guides. The App currently contains Tips and Tricks on Smoky Eyes, Red Lips, Classic Blow-dry, Groomed Brows, False Lashes and Flawless Skin. One of the features that I love on this App is one where you can save your beauty wish list by selecting products used in the videos to store in your Make-up Bag. You will then have a handy list when out and about shopping. In addition Marie Claire has carefully selected 6 celebrities whose looks we most want to emulate and created videos on how to create their eyes, skin, lips, hair and total look. 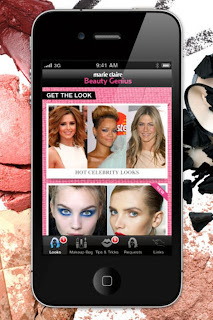 Beauty Genius is available to download now from the iTunes App Store for £1.19 and will be soon available for the iPad. I think it makes an excellent mini gift this Christmas for any beauty lover! This app sounds good! Must remember to download it :). Thanks for the comment on my blog :) .. the UK is never ready for snow no matter how organized they are! lol. But I do hope it snows! 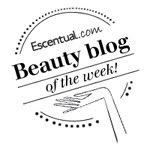 Thank you for the lovely review, We are filming more looks and I hope you enjoy them. Best Wishes, Jackie Tyson.